Lack of clean water for use by rural communities in developing countries is of great concern globally. Contaminated water causes water-borne diseases such as diarrhoea, which often lead to deaths, children being the most vulnerable. Therefore, the need to intensify research on point-of-use (POU) water purification techniques cannot be overemphasized. In this work, clay pot water filters (CPWFs) were fabricated using terracotta clay and sawdust. The sawdust was ground and sieved using 300, 600 and 900 μιη sieves. The clay and sawdust were mixed in the ratios 1:1 and 1:2, by volume. Pots were then made, dried and fired in a furnace at 850oC. Raw water collected from nearby rivers was filtered using the pots. The raw and filtered water samples were then tested for E. coli, total coliforms, total hardness, turbidity, electrical conductivity, cations and anions. The 600 μιη pot had the capacity to destroy E. coli completely from the raw water, whereas the 900 μm pot reduced it by 99.4%. The 600 μm and 900 μm pots could reduce the total coliform concentration by 99.3% and 98.3%, respectively. An attempt was also made to investigate the germicidal action of copper on the coliforms in raw water, with a view to utilising it in the CPWFs. 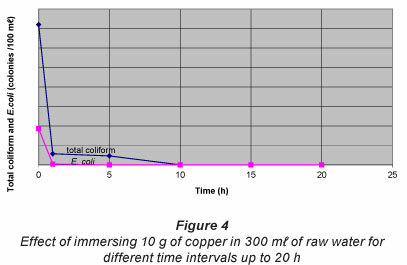 Results showed that 10 g of copper, in the form of mesh made of thin wire of diameter 0.65 mm, had the capacity to completely eliminate E. coli, by immersing it in 300 ml of raw water for 5 h, and total coliforms, by immersing it for 10 h. Subsequently, copper was added to the CPWF by placing the mesh in the receptacle of the CPWF. Tests showed that copper could destroy any remaining E. coli in the filtered water, rendering the CPWF a completely viable POU technique for producing clean water. All other critical parameters such as total hardness, turbidity, electrical conductivity and ions in the filtered water were also within acceptable levels for drinking water quality. The filtration rate of the pot was also measured as a function of grain size of the sawdust and height of the water column in it. The filtration rate was found to increase with grain size and height in all of the pots. According to a recent report by Water.org (2011), a US-based, non-profit organisation committed to providing safe drinking water and sanitation to people in developing countries, nearly 1 billion people - about 1 in 8 - lack access to clean water, with only 4 years to meet the Millennium Development Goals of the WHO-UN (WHO, 2010). More than 3.5 million people die each year from water-related disease, 84% of which are children. Millions of women and children spend several hours each day collecting water from distant, often polluted sources. It is estimated that 443 million school days are lost each year due to water-related illness. In the last 18 years, there has been only a 10% increase in the total population who have access to potable water (WHO, 2010). In 2003, the World Bank predicted that by 2015, 5-10% of the population of the Middle East, North Africa, Latin America and the Caribbean would still be without reliable potable water. It is estimated that 25% of Sub-Saharan Africa will not have access to potable water resources in 2015 (Plappally et al., 2011). Recently, several water filtration technologies have been developed by educational initiatives and non-governmental organisations (NGOs) to resolve potable water scarcity (Sobsey et al., 2008). Some of the most studied and surveyed techniques used around the globe for water purification are: chlorination with safe storage; combined coagulant-chlorine disinfection systems; sunlight exposure techniques such as SODIS, SOLAIR and UV radiation; reverse osmosis; ceramic filtration and bio-sand filtration (Naddafi et al., 2005; Plappally et al., 2011). A study aimed at determining the efficiencies of 5 filters, namely, biosand filter-standard (BSF-S), biosand filter-zeolite (BSF-Z), bucket filter (BF), ceramic candle filter (CCF), and silver-impregnated porous pot (SIPP), revealed that SIPP was the most efficient at removing bacteria and hence indicating that it can be an effective household water treatment system (Mwabi et al., 2012). A point-of-use water treatment system based on disinfection, flocculation and sedimentation has been used to remove microbial and arsenic contaminants from water and its potential for use in developing countries has been assessed (Souter et al., 2003). There is evidence that bromine disinfection is effective and safe for large-scale maritime applications and seems to be promising for household water treatment (McLennan et al., 2009). Mazariegos design to start a ceramic water filter production unit in Nicaragua. Since then PFP has provided consultation and training in several other countries worldwide (Potters for Peace, 2006). Since 1994, the Family Foundation of the Americas (AFA) has been developing these water filters for the poor in Guatemala, El Salvador and Honduras. UNICEF, in collaboration with an NGO in Myanmar, established a Community Development Association with the aim of introducing a water purification technology for households. More than 3 000 ceramic water filters were supplied in the Phyu village and schools in Myanmar (Plappally et al., 2011). However, no such attempts appear to have been made in Southern Africa, even though the situation of clean water availability is no different from that of the countries mentioned above. The CPWFs are manufactured by mixing local terracotta clay with sawdust or other combustible materials, such as rice husks. The combustible ingredient is ground and sieved and then burnt out by firing at temperatures low enough to prevent verification of the ceramic but at the same time high enough to completely burn out the sawdust, which is incorporated in the pot. The firing is done in an electric furnace at 800-900oC. This results in a structure with pores small enough to prevent bacteria and other contaminants from passing through, but large enough to allow a reasonable flow rate of water. In principle, clay pots made in this way are able to filter all particles and microorganisms larger than the pore size. One of the drawbacks of a CPWF is its inability to remove all pathogenic contaminants present in raw water. Many of the CPWFs reported in literature remove up to 98-99% of the disease-causing pathogens. It is therefore a common practice to incorporate an antibacterial agent such as colloidal silver into the structure of CPWFs as an additional measure to ensure further removal of these micro-organisms, and also to prevent the growth of moulds and algae in the body of the filter (Hwang et al., 2007). Since 1998, Potters for Peace has been assisting in the production of colloidal silver-enhanced ceramic water filters throughout the world. Test results have shown that they can eliminate approximately 99.88% of most water-borne disease agents (Potters for Peace, 2006). For centuries, copper is also known to have germicidal properties close to that of silver (Santo et al., 2008; Wilks et al., 2005). A novel aspect of this project is the use of copper in place of colloidal silver for complete elimination of pathogens by incorporating it in the CPWFs. Test results show that these filters are capable of producing pathogen-free potable water for domestic use. Porous pots were made using terra-cotta clay and sawdust. The sawdust was ground and sieved using 300 μm, 600 μm and 900 μm sieves. The clay and sawdust were mixed in the ratios 1:1 and 1:2 to make the pots, which were then dried for a week and fired in an electric furnace at 850oC. Firing time was 8 h and cooling time was 20 h. For initial tests, small pots of capacity 1 l and thickness of approximately 1.0 cm were made. (Throughout this paper, the pots are labelled with grain size of the sawdust and clay/sawdust ratio. For example, 300 μm (1:2) refers to a pot made of clay and 300 μm grain size sawdust, in the ratio 1:2). Raw water, collected from Lobamba and Mtilane Rivers in Swaziland, was filtered using the pots. Both the raw and filtered water were then tested for E. coli, total coliform, total hardness, turbidity, electrical conductivity, cations and anions. Filtration rates of the pots were measured as a function of the grain size as well as the height of the water column in the pots. A detailed study was carried out to determine the germicidal effect of copper in combating coliforms in raw water. 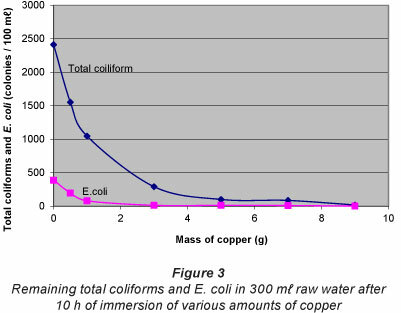 This was done by counting the number of coliform colonies remaining: (i) after immersion of different masses of copper in a fixed volume (300 ml) of raw water, and (ii) by immersing the same amount (10 g) of copper for different time intervals. Coliform tests were carried out on both raw water and copper-treated water samples. Finally, for fabrication of clay pot water filter for point-of-use application, 600 μιη (1:1 and 1:2) and 900 μm (1:1 and 1:2) pots were made. They had a capacity of 2 l and a thickness of approximately 1.5 cm. The pots were suspended inside plastic receptacles with lid and tap, as shown in Fig. 1. Copper mesh made of thin copper wire of mass 2.5 g and diameter 0.65 mm was placed at the bottom of the receptacle. Raw water and filtered water, with and without copper mesh, were tested for E. coli, total coliform, total hardness, turbidity, electrical conductivity, cations and anions. 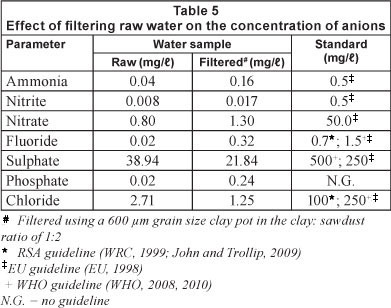 Table 1 shows the effect of filtering raw water on E. coli, using 300 μm, 600 μm and 900 μιη grain size pots. The 300 μm and 600 μm pots had the capacity to remove E. coli in the raw water completely. The E. coli level was as high as 9 600 CFU per 100 ml. However, the 900 μιη pots could not reduce the E. coli level to zero, even though a decrease from 9 600 to 1 CFU/100 ml (~ 99.99%) was achieved. The 1 CFU/100 ml of E. coli that remained in the filtered water may presumably be due to the larger pore sizes of these pots, which allowed the bacteria to pass through. The presence of E. coli indicates that the water could have been contaminated with animal or human waste and could cause waterborne diseases such as diarrhoea, which often lead to deaths, particularly among children. Because of the potential disease-causing characteristics of certain E. coli, removal of E. coli from raw water is a major step in all water purification systems. It is worth noting that the accepted level for potable water quality is zero CFU per 100 ml for coliforms. 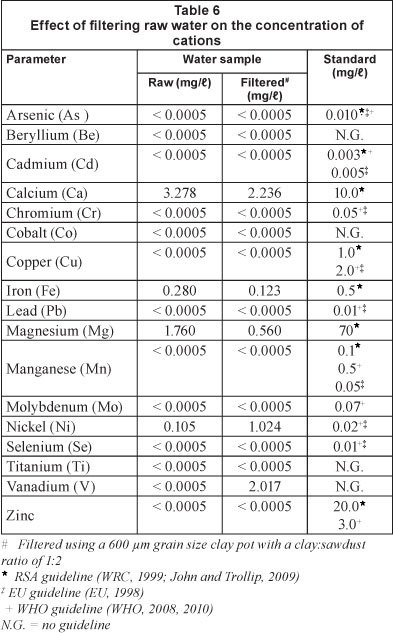 Table 2 shows the effect of grain size on the filtration rate of the pots. The data show that the larger the grain size, the higher the filtration rate. Filtration rates of the 600 μm and 900 μm pots were found to be about 2 to 3 times the filtration rate of the 300 μm pot. This is expected because larger grain size presumably results in larger pore size and hence higher filtration rate. In comparison with the 300 μm pot, the 600 μm pot would be ideal for small-scale water filters because of its higher filtration rate. Even though the 900 μm pot had the highest filtration rate, it had the disadvantage of not being able to remove the E. coli completely. 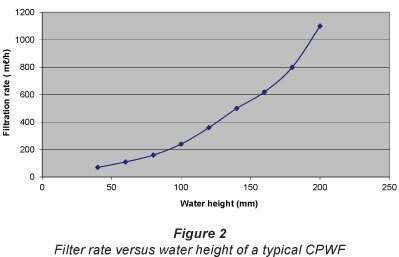 Figure 2 shows the variation of filtration rate with the height of the water column in a typical pot. Being gravity-driven, filtration rate is expected to increase linearly with height. However, the rate was found to increase non-linearly with height, as shown. For example, an increase in the height of the water column by a factor of 5 (from 40 to 200 mm) led to an increase in the filtration rate by a factor of about 15 (from 70 to 1 100 ml/h). This non-linearity can be explained by the fact that water filtration takes place not only through the base of the pots but also through its sides. From a practical point of view, it is therefore advisable to design pots that are as tall as possible in order to get the maximum filtrate. Figure 3 shows the germicidal effect of copper, in 300 ml raw water, as a function of mass. 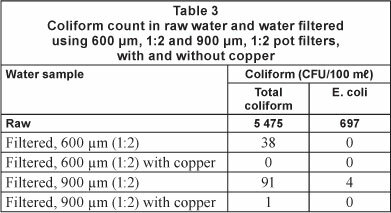 As seen, the coliform colonies remaining in the water decreased with the mass of copper added.. For example, 1 g of copper reduced the total coliform level from an initial count of 2 413 to 1 046 CFU/100 ml (~ 56.7%) in 10 h, while 9 g of copper had the capacity to reduce the level to 18 CFU/100 ml (~ 99.3%) within the same time interval. A similar trend was seen for E. coli. The germicidal effect of copper as a function of time is shown in Fig. 4. It is observed that the number of coliforms destroyed increases with time. For example, 10 g of copper can reduce the E. coli level from 186 to 4 CFU/100 ml (~ 98 %) in 1 h and to zero (100%) in 5 h. Total coliform was reduced to zero after a period of 10 h. A similar decrease in E. coli concentration in river water isolates, using copper pots, has been reported (Shrestha et al., 2009). To the knowledge of the authors, no work has been found in literature on the use of copper in CPWFs for its germicidal action. It is noted that in both cases (Fig. 3 and Fig. 4) the activity of copper is much stronger initially. This is because an essential condition for the inactivation of the bacteria is that they come into contact with the metal. Hence, the larger the number of coliforms present in the vicinity of the copper at a particular instant, the greater the chance that the coliforms will come into contact with it and be killed, since the coliforms move about randomly in the water. Table 3 shows the coliform counts in raw and filtered water samples using 600 μm and 900 μιη pots. The initial count for total coliforms and E. coli in the raw water was 5 475 and 697 CFU per 100 ml, respectively. The 600 μπι pot reduced the total coliform count to 38 CFU per 100 ml (nearly 99.3%) and the E. coli count to zero. Incorporation of copper in the receptacle reduced the total coliforms to zero as well. The 900 μm pot reduced the total coliform and E. coli levels by 99.3% and 99.4%, respectively, and addition of copper in the receptacle reduced their concentrations by 99.98% and 100%. These results suggest that use of copper in the CPWF is an effective means to eliminate coliforms in raw water. Thus, there are two mechanisms responsible for the removal of impurities from contaminated water - the physical process, using the pores in the structure of the pot, and the biological process, through the germicidal effect of copper. Silver is another metal known to have germicidal action on microorganisms (Blanc et al., 2005; Landeen et al., 1989; Lin et al., 1996; Jayesh et al., 2008), and has been effectively used in CPWFs in colloidal form and as nanoparticles (Hwang et al., 2007; Halem et al., 2007). However, fabrication of such silver-impregnated filters can be cumbersome if it is to be carried out by a rural community, as compared to using copper mesh. Moreover, silver is expensive and not easily available. 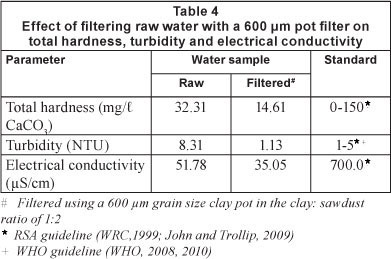 Table 4 shows the effect of filtering raw water samples on total hardness, turbidity and electrical conductivity of the filtrate, using a 600 μm pot. Total hardness in the raw and filtered water was within the RSA standard for potable water. Filtration could reduce it by nearly 55%. Total hardness in the range 0-200 mg/l CaCO3 has no adverse health effects (RSA guidelines: WRC, 1999; John and Trollip, 2009). Turbidity in the raw water was much higher than the RSA and WHO limits. Filtration reduced it from 8.31 to 1.13 NTU (~ 86%), which is an acceptable level for potable water. Turbidity does not have any direct adverse health effects. However, it provides information about the presence of suspended solids, and is a measure of the cloudiness of water. Electrical conductivity of the raw and filtered water was found to be within the RSA standard. Filtering reduced it from 51.78 to 35.05 μS/cm (~ 32%). Electrical conductivity has no adverse health effects below 700 μΒ/cm, but indicates the total dissolved salt content in water. Table 5 shows the effect of filtering raw water samples, using a 600 μηι pot filter, on the concentration of various anions. The sulphate ions were reduced to 21.84 mgl (~ 44%) whilst the chloride ions decreased to 1.25 mg/l (~ 54%). The rest of the anions, namely, ammonia, nitrite, nitrate, fluoride and phosphate ions, showed an increase in concentration after filtering. This could be a result of leaching as water passed through the pot. Even though the concentration of these anions increased, their levels in the filtered samples were still within acceptable limits for potable water. Table 6 shows the effect of filtering raw water, on the concentration of various cations. Calcium, iron and magnesium ions were reduced, while the concentration of nickel and vanadium ions increased, presumably because of the presence of these ions in the clay. There was no noticeable change in the concentration of the other cations. Porous pots were made from terracotta clay and sawdust. The clay and sawdust, ground and sieved using 300 μηι, 600 μιη and 900 μΓη sieves, were mixed in the ratios 1:1 and 1:2 to make the pots. They were then dried and fired in an electric furnace at 850oC. 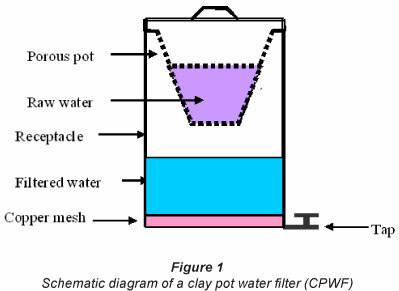 The pots were suspended inside plastic receptacles to make clay pot water filters (CPWFs) for point-of-use (POU) application. The filters were tested for their ability to purify raw water obtained from local rivers. The 600 μιη filter yielded water that was completely free of E. coli, and reduced the total coliform concentration by 99.3%. 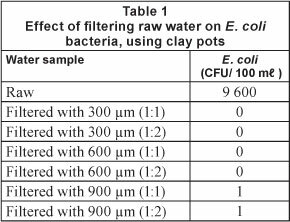 The 900 μΓη filter could reduce the E. coli levels by only 99.4% and the total coliform levels by 98.3%, but had the advantage of having a higher filtration rate compared to the 600 μπ filter. Tests showed that copper is a suitable antibacterial agent to combat coliforms in contaminated water. Copper mesh made of thin wire of diameter 0.65 mm was placed inside the receptacles of the filters. This resulted in the 600 μm filter being able to eliminate the total coliform completely from the filtered water, whilst the 900 μm filter reduced it by 99.9% and eliminated the E. coli completely. The use of copper as an antibacterial agent in the CPWF is therefore an effective and reliable means for producing clean water for domestic use. The filtration rate was found to increase with the grain size of the sawdust and height of the water column in the pot. These factors need to be taken into account when designing pot filters for practical use. The authors are grateful to the Physics Department of the University of Swaziland for financial support and Mr. Comfort M. Nkumane of Ezulwini National Handicraft Centre for making the clay pots. Received 24 November 2011; accepted in revised form 21 September 2012.